Surely Cuthbert Dibble and Grubb are now based at Trumpington rather than Trumpton ? Seems there was another derailment last Thursday. Indeed - thank you for that alert, eightf48544. 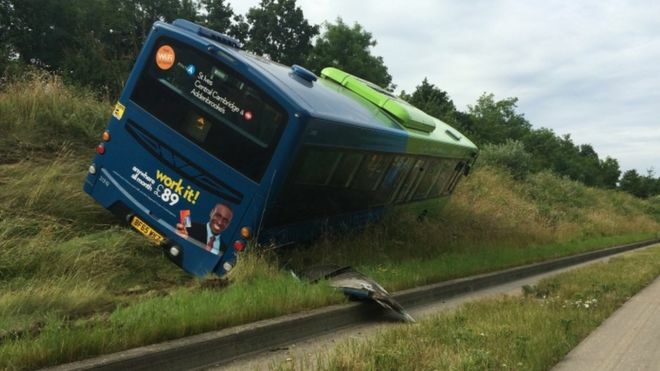 A bus has come off its guided tracks in Cambridge and mounted a grass verge. There were no passengers on board the single decker and the driver was not injured in the incident, which took place shortly after 07:30 BST. The scene on the Guided Busway on Hauxton Road, Trumpington, is not far from a section where another bus derailed earlier this year. 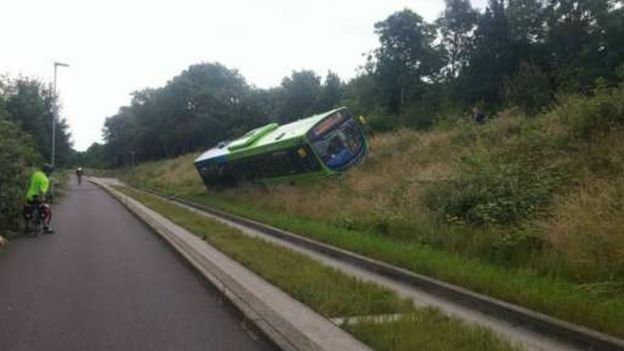 The bus is being recovered from the verge of the busway which was opened in 2011 at a cost of Ã‚Â£181m. Services are currently diverted between Trumpington and Addenbrookes. Andy Campbell Stagecoach East Managing Director said: "As well as carrying out our own investigation, and accessing on-board CCTV footage, we will work with the police and other relevant bodies to establish the cause of this incident as quickly as possible." In February, Stagecoach dismissed a driver who derailed a bus after driving too fast and crashing, injuring five passengers. Presumably the ORR will be involved. Is there a bus equivalent of the RAIB the BAIB? I rather think that would be the Office of Rail and Road themselves - a (mis)guided bus being perhaps the worst of both worlds. The Cambridge busway is 16 miles long in two bits with a service road one side and an embankment along most of the other. 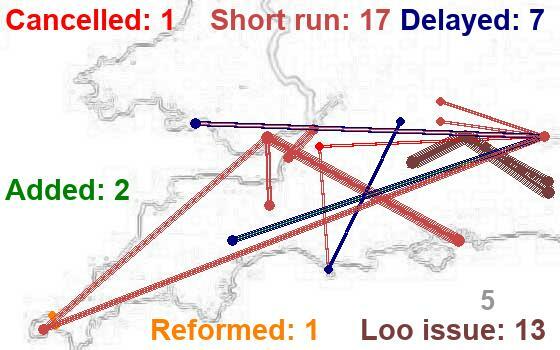 "Derailments" occur at the points where the bus enters or leaves the guided bits. Bristol's as yet unfinished busway is 2.4 miles long with 9 entry / exit points, and has the New Cut of the River Avon beside it on one side. Time for a new risk assessment? Yes. I've just made it and decided it's more risky than I thought! Ah, so perhaps that wall isn't just for flood defence then? A new section of the busway has been under construction for what seems an age - and this evening I got a first chance to use the footpath alongside it - headed from the Milton Road towards the new Cambridge North Station, which will probably open just after I finish all my regular trips up here. The new taxi rank is also open at Cambridge Station. 1. How are the buses guided along this guided busway? I don't see any raised guides, just a dashed white line, and I'm wondering is the buses are guided by having a chap with a steering wheel sitting in them, reading the road layout with his eyes and adjusting the vehicle's direction accordingly? How does this vary from a regular bus? 2. I'm working in one of the buildings just behind the fence, but I have to walk some 400 yards north west to get on the guided busway path on which I can then walk the 400 yards back south east to where this picture was taken; I think it's a couple of hundred yards further on to the station site. 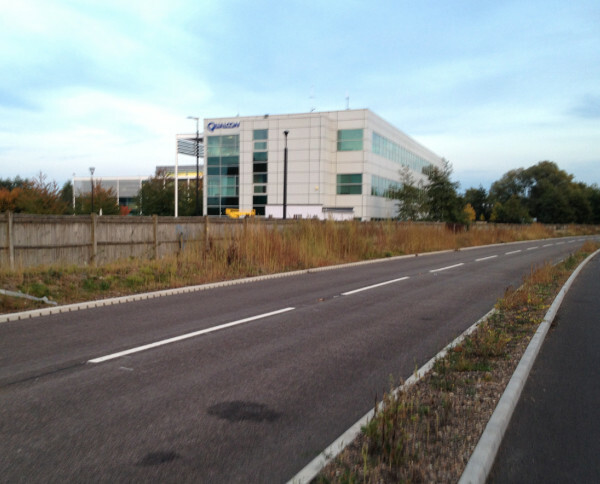 Why isn't there a path / crossing from the busway into this heavy employment area, allowing people working there to get across to the residential area opposite (which is connected) and the station? It would make the path / busway / station so much more useful! 3. There's no queueing sign or queue system at the new taxi rank at Cambridge station. A train arrives and people flood out, staring at the front of the taxis and walking back to find one that's available. Then the front taxis move away and the other pull up, bypassing the people walking up to them and loading people who arrived later off the train. Why isn't there a "queue here" sign or something, and / or a series of numbered loading points to help the customer know what to do? Is the system set up more to look pretty without signage than to work? I love learning lessons from elsewhere in the UK, but sometimes I'm so saddened to feel that I'm learning what to avoid and not what to ask for our council to copy! It will operate like a normal bus. General opinion round here is that the council finally realised the "guided" part of the busway was a total waste of money. I'm very much looking forward to Cambridge North opening. 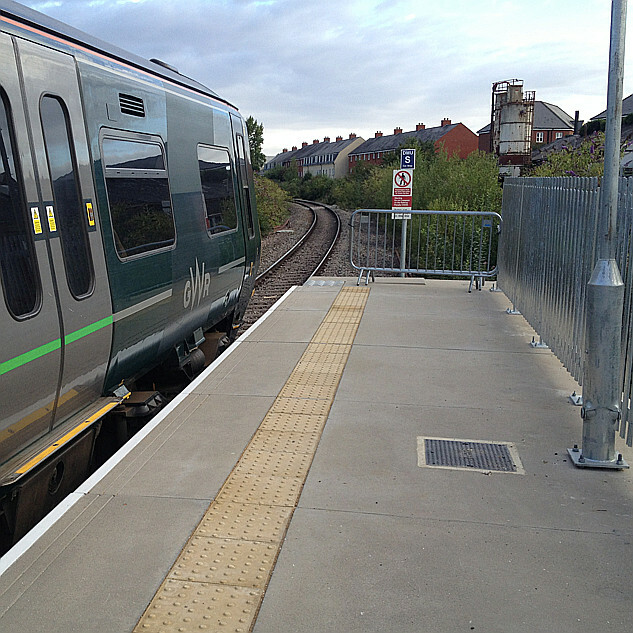 At present, the journey to Cambridge station (on public transport) adds about 45 minutes to my rail journey, so driving is often an easier choice. Cambridge station gets incredibly busy at the weekends. I would argue it is probably not fit for purpose, in it's current form. A few weeks ago, I counted 30+ people queuing for the TVMs (and roaming staff with Avantix machines) and about 25 at the manned ticket office. The queue for the ticket office moved so slowly, I missed my train. I ended up driving the journey, which actually turned out to be much cheaper. It seems Cambridge wanted more busways, but then changed their mind! but for what? Plans were afoot by the Greater Cambridge Partnership to create the county’s second multi-million pound guided busway as part of transport improvements along the A428 Cambourne to Cambridge corridor. However, the guided busway has been altogether dropped in favour of an enhanced metro scheme around Cambridge. An electrically powered, rubber tyred and “environmentally sound” vehicle will serve this section instead. A little delving suggests that CAM might be similar to what Mayor Marvin is proposing for Bristol - a bus that follows a white line painted on the road. On the bright side, at least it won't require pointless sections of guideway. Is it reserved white line or can anyone drive along it? Just think - if you were fed up of being woken by the first bus of the morning going past your bedroom window, you wouldn't even need to ask the council or bus company sort it out. Just nip out in the dead of night with a tin of black paint and a tin of white, and you could reroute the service down the next street. I have had a very peripheral involvement with new public transport schemes in Cambridgeshire, whose county council fell in love with guided bus lanes some years ago, concreting over the old Cambridge to St Ives branch - a scheme that ran hugely over program and budget, and ended up as a massive claim against the contractor. In the course of my involvement I was informed by an experienced transport consultant that the bus companies do not actually like them.They involve expensive additional fitments to buses and the additional risk of damage from the bus way structures. They would rather just have ordinary roads built with access restricted by barriers or signage.